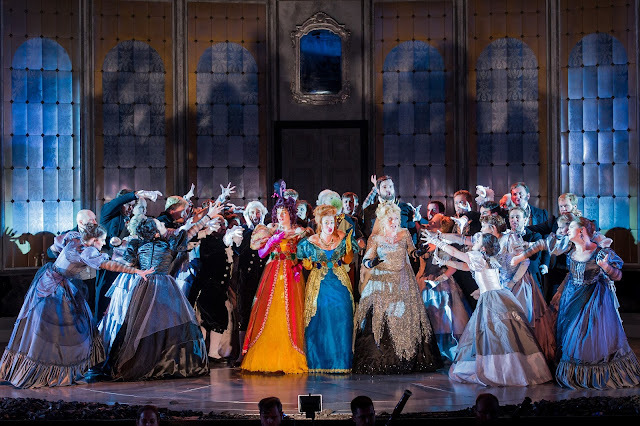 Heather Lowe as Tisbe, Fleur de Bray as Clorinda, Victoria Simmons as Angelina, Nicholas Lester as Dandini and the Opera Holland Park Chorus in La Cenerentola at Opera Holland Park. Photographer Robert Workman. We caught up with Oliver Platt's new production of Rossini's La Cenerentola at Opera Holland Park on 20 July 2016, the production's third outing. Dane Lam conducted the City of London Sinfonia with Victoria Simmonds as Angelina, Nico Darmanin as Prince Ramiro, Nicholas Lester as Dandini, Jonathan Veira as Don Magnifico, Barnaby Rea as Alidoro, Fleur de Bray as Clorinda and Heather Lowe as Tisbe. Designs were by Neil Irish with lighting by Mark Jonathan and movement by Emma Brunton. The production is a co-production with Den Jyske Opera in Denmark. Whilst Rossini is still best known for his comic operas, in fact these all come at the beginning of his career. In 1817 he wrote two comic works La Cenerentola and La gazza ladra, the latter opera being the last comic opera he wrote in Italian, with only Le Comte Ory (written in 1828 for Paris) to come. But with the two Italian works from 1817 Rossini is clearly interested in something more than sheer comedy, La gazza ladra is an opera semi-seria with a mixture of serious and comic elements, and La Cenerentola is moving in that direction. Oliver Platt's production rather emphasised this by having Victoria Simmonds' Angelina somewhat separated from the main body of the action (rightly so, she is a servant after all). This meant that Simmonds' beautifully sung, rather thoughtful Angelina hardly took part in the highly physical performances of the many comic ensembles which dominate the first act. It is possible to play the whole of the opera as a serious comedy (Peter Hall's production at Glyndebourne did this), but Platt seems to have been interested in the way Rossini mixed serious and comic, and brought this out. Neil Irish's setting gave us a curved early 19th century interior, shabby and decaying with changes in colour to the decor evoking three different spaces, bedrooms for Clorinda (Fleur de Bray), Tisbe (Heather Lowe) and Don Magnifico (Jonathan Veira), whilst at the edges of the stage were the servants areas occupied by Angelina (Victoria Simmonds). (This separation meant that for much of the time Simmonds sang her solo moments from stage right, rather than centrally. ) For the scenes in Prince Ramiro's palace, the panels in the walls rotated to transform the interior into a grand room; it had the showy tastelessness which for me evoked the interiors associated with the Bourbon regime in Naples (for whom Rossini worked from 1815 to 1822). The costumes were of a similar period, with some wonderfully over-done outfits for Tisbe and Clorinda which contrasted with the shades of grey dresses for the women at court. The women of the chorus were employed as supers, even though they get nothing to sing, to get over the fact that the Prince's court is, musically speaking, an all male affair. Another joke in the first half was that the chorus accompanying the Prince on his hunt for a bride were all got up as huntsmen and game-keepers. The production was full of movement, with stage action reflecting the music so that complex strettos would be accompanied by complex yet stylised choreography, solo moments which occurred during an ensemble were emphasised by having the chorus freeze and just the soloists move, moments of stasis had the soloists staying still in a row. And throughout the ensemble constantly reacted to what was going on. It was admirably performed by the cast, creating some very striking musico-dramatic moments but though highly detailed and stylised it was perhaps a bit too busy. The first act is very long (over 90 minutes) and Platt's approach emphasised individual detail rather than the architecture and for all the buzzing energy on stage, the end of the act seemed a long time coming. Victoria Simmonds' Angelina was one of the most beautifully sung accounts of the role that I have heard. There was a serious, understated quality to her performance with the fioriture given in a finely phrased manner which did not have the showy, look at me quality that many performers have. 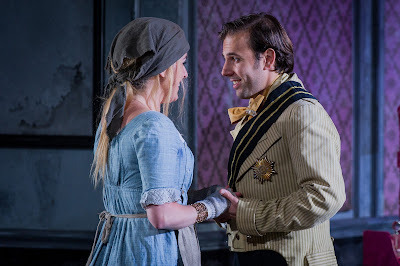 This was not to say that she lacked character, Simmonds' Angelina clearly had spirit in the way that she stood up to her step-father, Don Magnifico (Jonathan Veira) and she radiated quiet charm so you could understand that the Prince (Nico Darmanin) could easily fall in love with her. But like a quiet person in a noisy room, there were moments when you had to pay attention to appreciate her against the visual hi-jinks going on elsewhere. But when she got solo moments you certainly paid attention, the moment when she begs her step-father to go to the ball was profoundly moving and of course the final rondo was glorious. Jonathan Veira's Don Magnifico was a wonderfully rounded creation, both comic and self-centred to the point of malevolence. His cruelty to Angelina (saying she was just a servant and that his third daughter had died) was all the more telling for being casual and taken for granted. Yet there was something charming about him too. And Veira has a lovely way with Rossini's vocal line, giving it that gloriously rounded, orotund quality that you want from a buffo bass. Recitatives (accompanied by piano) were nicely detailed with a sense of vocal character complementing Veira's highly physical performance. Nico Darmanin has a very particular voice, with a certain tightness to the tone allied to great vibrancy. Yet he sings with a fine fluency throughout the range and has a wonderful, expressive facility to really sing Rossini's complex vocal lines. His Prince had a certain naive charm and like Simmonds' Angelina, there was an understated quality to his character with Darmanin playing the observer as Nicholas Lester's Dandini held attention as he really played up being the Prince. But this meant that in their short scenes together Simmonds and Lester brought a sense of the quiet centre amidst the chaos. Almost orchestrating this was Nicholas Lester as Dandini, and I loved the way Lester really brought out the feeling that Dandini was enjoying playing his master and pushing it as far as he could go. There was a nice twinkle in his eye which came out in the music too, always a good sign. Lester was a fine Figaro here in Rossini's The Barber of Seville in 2014 (see my review) and as Dandini he showed that he has a musical feel for Rossini's comedy, and the role's high tessitura seemed to hold no dangers for him. The two step-sisters ( Fleur de Bray and Heather Lowe) were gloriously monstrous creations. The two singers forming a nicely contrasting double act, both equally appalling with Lowe's Tisbe as the quiet, simpering one whilst de Bray's Clorinda was more bad tempered, with a nice line in gurning, At the same time De Bray and Lowe were having the time of their life singing Rossini's music. Barnaby Rea was Alidoro, the philosopher who is the architect of the whole plot. Rea sang Alidoro with quiet dignity and strength, rising above the chaos he lets loose. Rea delighted us with his big Act One solo, singing with great warmth and charm. 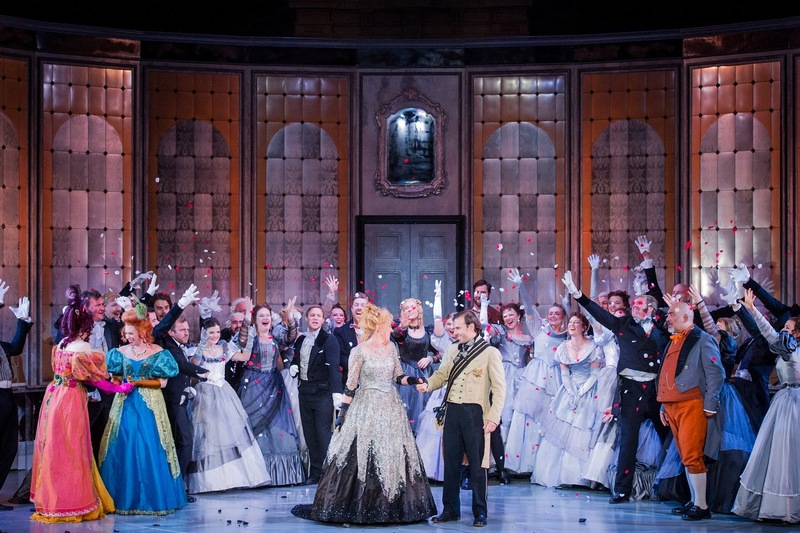 Jonathan Veira as Don Magnifico and the Opera Holland Park Chorus in La Cenerentola at Opera Holland Park. If I said that Dane Lam and the City of London Sinfonia gave a relaxed account of the overture, then that might give the wrong impression. But though their performance was tight in its detail with a great sense of the mechanism being in firm control, Lam also gave a feeling that there was no hurry, just a calm sense of purpose. Throughout the opera, despite some swift speeds, Lam and the orchestra kept this feeling so that it rarely felt driven. There was space for the singers, but overall a relaxed purposefulness with some lovely detailed playing from the orchestra. This was the sort of performance where you could generally take the performers' technique for granted. 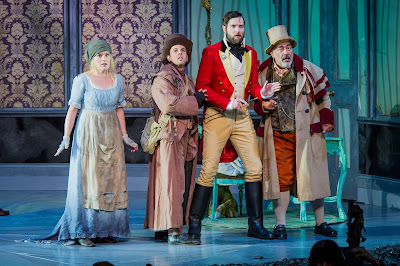 The standard of Rossini singing was highly creditable so we were able to enjoy the great charm and vivid theatricality which the performers brought to the performance. In his exploration of both the serious and comic sides to the opera, you felt that Oliver Platt would be a natural for Rossini's La gazza ladra, perhaps another year?